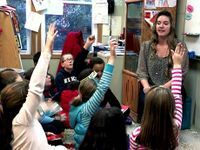 An inquiry-based curriculum requires both planning and flexibility, as well as a teacher knowing the students well enough to anticipate their interests and limits. As a fourth-grade teacher at an inquiry-based learning school, I've come to understand the importance of planning. Planning is critical and also best practice. I still plan at the beginning of each week and each day. A teacher without a plan has no purpose or learning objectives for her students. With student-directed learning, there's a major difference between planning and flexibility. I plan according to what my students need and how I'm going to assess their skills or knowledge, just like every other teacher. The difference lies in the delivery of instruction. A teacher must always be flexible and adaptable. You might wonder how lesson planning works if you're always reconstructing on the fly. I've found that if the students take the lesson in a different direction than what I've planned for, it's my job to light their way to where my intention and their intention meet. Most often, if their curiosity takes us in a completely different direction, I let them run with it. However, I also let them find the connection between what I need them to learn and what they want to learn. What qualities/character traits do billionaires possess that make them so successful? What evidence proves that billionaires possess responsible financial management? What financial decisions enabled that billionaire to purchase such luxuries? Why do billionaires have so many of these luxuries? This returned my students to thinking about budgeting, spending and saving wisely, and the decisions or traits of proven financial managers. So the right questions foster powerful learning. Ultimately, a teacher's job is to light the way for her students, to guide them to their own path of discovery. In this day and age, if students want to know something, they can and will look it up. The true art of teaching is to ask the right questions, become a thought partner (interaction during instruction), and then assist in students' discoveries. The idea behind true inquiry-based learning is to ignite your students' curiosity, the spark that motivates them and makes them want to learn more. If I can bring out my students' curiosity and love of learning, then I've covered what I needed to cover. Google can do the rest! Good teachers are masters of connecting ideas and finding creative ways to squeeze in the necessary content. I hardly wait to see what my students respond to because I know them and can sometimes predict what will grab their interest. For example, last year I took the opportunity of connecting a grammar lesson to something the students wanted to learn about -- the latest celebrity news. I printed out several celebrity Twitter feeds, gave them to my students, and told them to find all of the celebrities' grammatical errors. My students had fun and learned more about grammar than I could have taught them. Our units consist of three lines of inquiry that we explore simultaneously. We spend about five weeks doing this, which breaks down to about a week and a half per line. If students are really excited about one line of inquiry, we'll spend two weeks on that one and less on the others. As a teacher you can always get a feel for when it's time to stop doing something. Once the kids have already inquired about the topic, explored it, researched it, and produced something to demonstrate that they understand it, you can read that they're done. I believe in student voice and choice and giving them time to produce something that demonstrates acquisition of knowledge and understanding. I have them choose how they're going to prove to me that they learned something. When they've done that, we move on. When students hit roadblocks and want to "ditch" that line of inquiry, I encourage them to take a different approach instead of giving up. All they need is a one-on-one meeting with me for feedback and planning their next steps. They almost always feel refreshed after that and finish what they've started. An activity called "What I See, What I Think, What I Wonder"
A teacher should also start teaching how to ask questions, because good questions lead the inquiry. 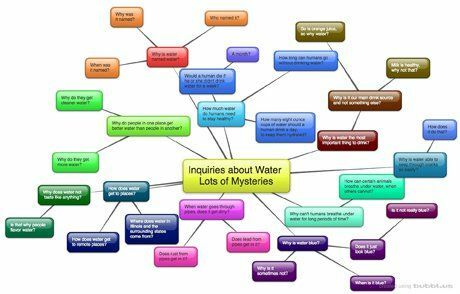 Students in inquiry mode can start developing their own questions about the unit being taught. This mind map, created by a ten-year-old, illustrates her curiosity about water at the beginning of the unit. By the unit's end, this same student designed and built her own website as a result of her inquiries. At the beginning of each unit, my students always brainstorm a list of questions about the unit's title. They do this by recording them in their Inquiry Journals, or by creating mind maps online. After my students create their inquiries, we have conferences to discuss which inquiry path they'll investigate. When that is chosen (based on the question), the students plan how they'll investigate, design, and create a product or project to then share with an audience. We have an Inquiry Fair at the end of each unit, open to parents, other students, and teachers, because my students really take ownership of their learning and invest so much time in their projects that they want to share them with the world! Each student should be experiencing the unit in a different way because, as individuals, we are all unique. Inquiry-based learning helps them personalize the content in ways that make it truly meaningful to them. This blog post is part of our Schools That Work series, which features key practices from Wildwood IB World Magnet School.